a thriving Baltimore community steeped in history and art! 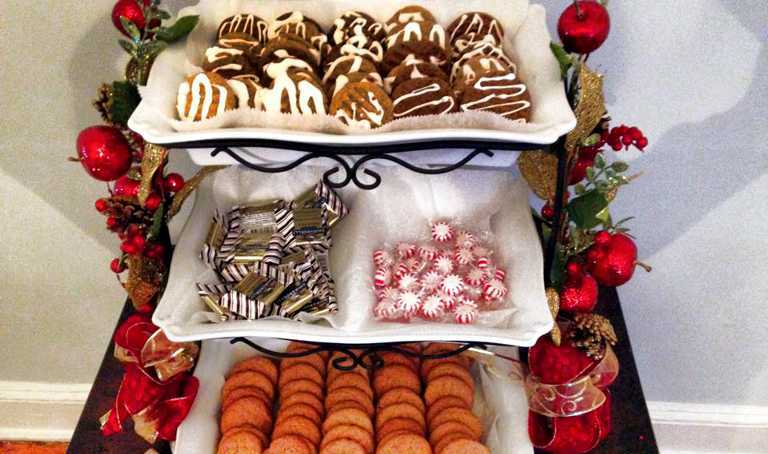 The Christmas Cookie Tour is Sunday, December 9, 2018 - and you’re invited! 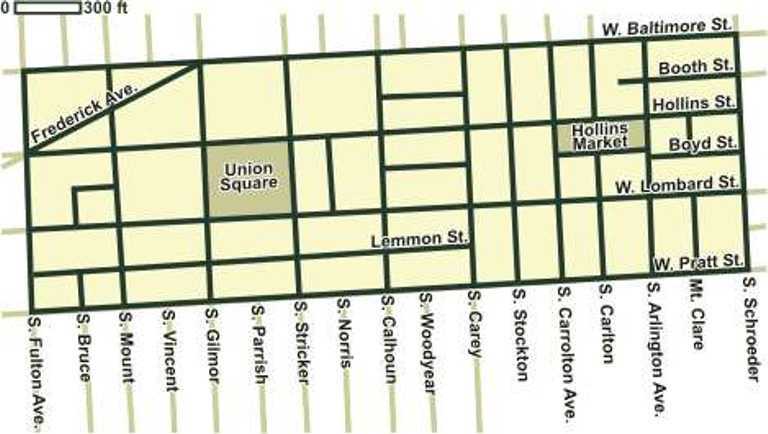 Named for the graceful park at its center, Union Square combines with the Hollins Market area as the Union Square-Hollins Market Historic District – designated a National Register Historic District in 1967. 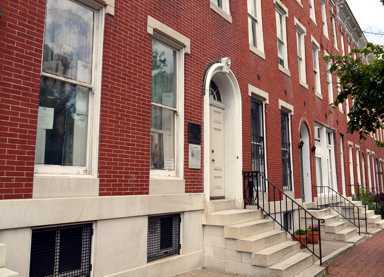 It is a diverse residential urban setting in SoWeBo (SouthWest Baltimore) – home to art galleries, studios, and spacious examples of traditional Baltimore rowhomes with Federal, Greek Revival, and Italianate architecture. 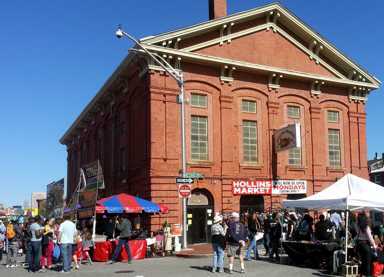 Hollins Market, built in 1838, is Baltimore’s oldest home to food merchants. 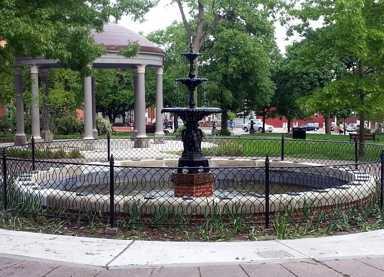 Also in the Union Square Historic District, attractions include annual events such as the Union Square Christmas Cookie Tour and the Sowebo Arts, Inc. Sowebohemian Festival, plus the Black Cherry Puppet Theatre, the H. L. Mencken House, the Southwest Baltimore Charter School, the H. L. Mencken Memorial Fountain (1976), the Enoch Pratt Free Library No. 2 Branch (1886), and Union Square Park with its Greek Revival Pavilion (1847). The District is bounded by South Fulton Street to the west and South Schroeder Street to the east, with north and south borders of West Baltimore and West Pratt Streets. The area is built on a grid street system which conforms to the original 1818 layout of the area. Located approximately ten blocks west of the Inner Harbor, other nearby sites of interest include Camden Yards, Ravens Stadium, the B&O Railroad Museum, the Lithuanian Hall, Carroll Park (and the Carroll Park Golf Course), the Mount Clare Museum House, the Babe Ruth Birthplace & Museum, the Edgar Allan Poe House and Museum, the Irish Shrine and Railroad Workers Memorial Museum, the UMB BioPark, and the new Horseshoe Casino. Find out why people say this about the Union Square Christmas Cookie Tour. Come for the cookies, then visit and discover our unique community! Be sure to mark your calendar for the second Sunday of December. Click the “Tour Details” button (below) for more information including driving directions and online ticket purchasing options. 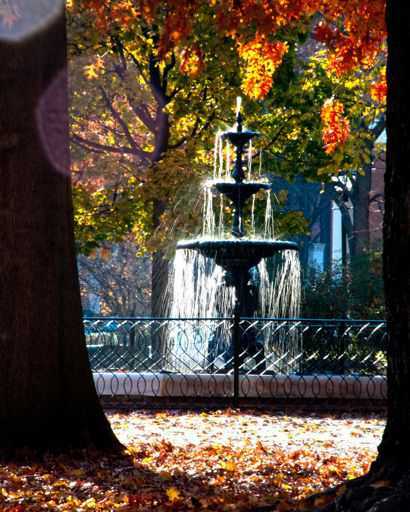 Just west of the Inner Harbor, the Stadiums, and Downtown Baltimore – Union Square is close to the heart of the City. 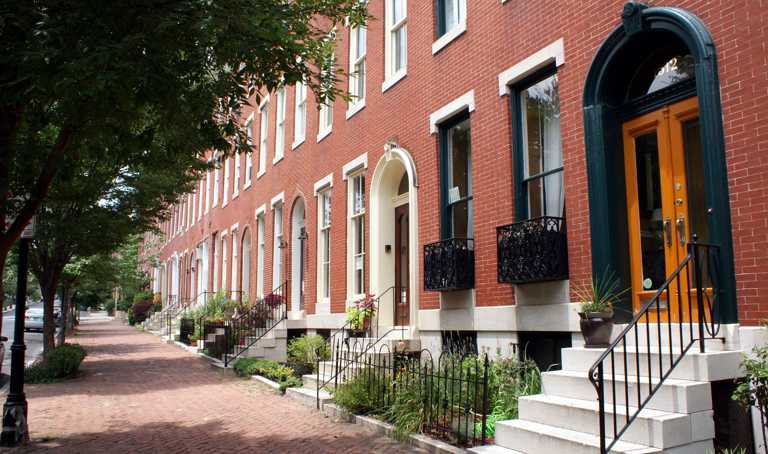 On the Square and on nearby streets, spacious three-story row houses predominate. Most are pre- and post-Civil War Italianate in style, but there are many examples of Early Victorian Greek Revival and Late Victorian Romanesque Revival. A majority of the homes have ten- to fourteen-foot ceilings, tall distinctive windows, wood floors, and plaster walls. Exteriors are brick and mortar facades with attractive cornices and marble steps. On the side streets and alleys there are an additional variety of charming two-story and two-story-with-attic rows. Home prices range from $20,000 to $500,000. Contact your Real Estate agent for available listings in Union Square. Union Square was on Facebook years before it became the cultural phenomenon we all know today. If you haven’t seen it, the Union Square Baltimore Facebook page is a great way to keep up with community news and activities. Click on the image and get connected. While you’re there, be sure to click the “Like” button - and check all the comments and photos from other Union Square fans and residents. You’re invited to join the Union Square Group at LinkedIn. Joining will allow you to find and contact other Union Square members on LinkedIn. Join the Facebook Union Square Open Group. Post content of interest to current residents - as well as former residents, people with ancestors from the area, Mencken fans, Cookie Tour fans, Sowebo Arts Festival fans, etc., PLUS potential homebuyers considering the purchase of real estate in Union Square. Maintaining a 160-year-old home in a historic district presents special challenges for residents. Often it’s a matter of finding a qualified contractor to perform a big job - or it’s a question of how to best tackle a do-it-yourself project. You are cordially invited to visit us as we open our homes to celebrate the season. This family-friendly event returns every year on the second Sunday of December. Reviews of businesses, eateries, watering holes, and the many other attractions in (and around) Union Square. Photostream images of Union Square. Online album with more images of Union Square. Watch the playlist of videos about Union Square. Businesses, eateries, and attractions in Union Square. A map and driving directions to Union Square. Chris Everett Design ©2002-2015. All rights reserved, so there!